The result of Apple trademarks not passing in Chinese courts: "iPnoho6"
The RAM disk utility “RAMDrive” is on sale in the app store. A RAM disk or RAM drive is what uses part of your primary storage as a disk drive. The app “RAMDrive” allows you to create your own RAM disk. That means, if your computer has a large amount of memory, you can use a part of it as the RAM disk. Even the Mac Mini today has a 16GB max storage, so RAM disks can be comfortably used today by the average person. As the app store says, “the speed of such disk can be up to 5 GB per second.” That’s obviously faster than a standard disk drive and even faster than an SSD. Making the bank-switched RAM behave like disk drives harnesses this speed because it frees the RAM from the limitations of the data bus and CPU. 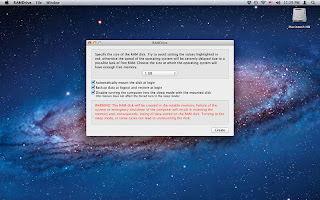 The disadvantage of the RAM disk, however, is that it is created in the volatile memory. It means that if you turn your computer off, all the data is lost, thus making the functions of it limited. 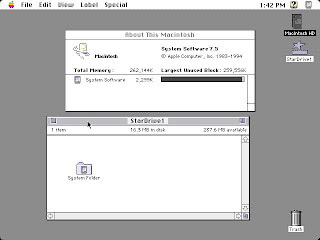 When RAM disks were a standard utility in the Mac OS of the past, several megabytes of the RAM disk would be used as a Photoshop scratch disk...perhaps it could be used in a similar fashion today. Recently, there's been quite a few accessories for the iPad where you could hold it with just one hand. The whole point of it, though, is not design but health. Health issues are emerging in the design of tablets being too thin. The thin tablets are making consumers "pinch and hold" with one hand. But this pinching action could create an inflammation in the tendons called Tenosynovitis. It's an inflammation in the thumb side of the wrist and you could get it if you are pinching your tablet for a prolonged period of time. At the Town Hall Meeting held at 10AM yesterday, Apple CEO Tim Cook announced a new discount standard for employees. It used to be 25% on all kinds of Macs (1 purchase per year; 15% off for friends and relatives up to 3 purchases per year). Now it's a $500 discount on Macs (except Mac minis) and $250 discount on iPads. The new discount can only be used once every 3 years. The amount of discount increased but the number of times you could use it decreased. Was it really that great of a change? Nothing could have been more exciting when the Town Hall Meeting was first held in a long time by then CEO Steve Jobs in July 2007. It was the day before the iPhone was going to be released on the historic Friday (28th). He announced there that all full-time and part-time Apple employees who'd been working for more than a year (apprx. 20,000 employees) will get a free 8GB iPhone with a retail price of $599. That's basically a $12-million giveaway by the company. How discouraging it must have been for the employees who knew the Town Hall meeting in 2007 to go to the 2012 meeting and hear that they'll only get a $250 discount on iPads. Steve gave away free iPhones in anticipation of great revenue increases in 2007 (which did actually happen), but Tim's announcement came after one of the greatest revenues in history and all he did was give a $250 discount. There's sizzling hot news out there on Apple these days. I couldn't help but also introduce them here on my blog. With the SSD support on the Mac Mini (Mid 2011)--it no longer has a superdrive--you could easily turn your mini into your main machine without spending heaps of money. 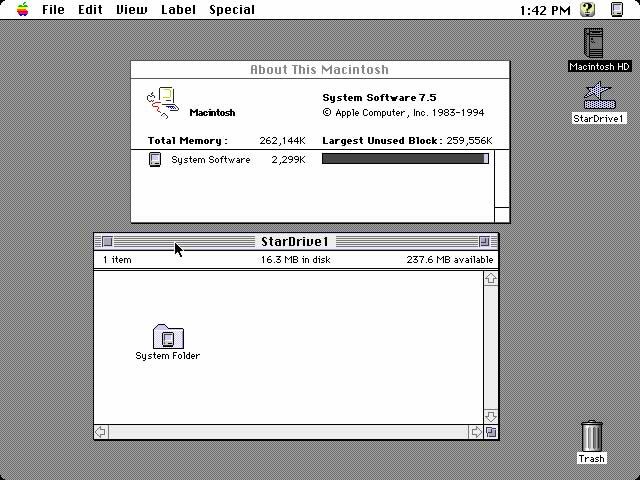 You don't have to pay Apple's $600 for a 256MB SSD BTO, as long as you have a SSD and an installation kit. In addition, Apple's BTO is a SATA 2.0 drive, so it won't generate the same speed as a SATA 3.0. The Core i5 CPU on the Mac Mini is already pretty good, but by using an SSD as your boot drive, you are guaranteed improved responsiveness and, above all, a super fast initial boot up time. Intermediate skills are required for installation. You can see our online manual here. At Your Mac Store, we sell an SSD Installation Kit for iMac Mid 2011. It comes with an installation manual copyrighted by us. Important: Some iMacs may not have mounting points for an SSD. Please check if your iMac has mounting points as this image shows. Use with app, dock connector, and pedal to produce guitar effects. It's amazing how iPad Apps are being given real-life applications more and more over the years--an output and venue in the guitar/bass industry is just another example. Apps like GarageBand, AmpliTude, JamUp can now be used in sync with a real effects controls and a pedalboard through the AmpDock device introduced by Alesis in the "NAMM Show 2012" in Anaheim, California. Alesis states: "You can use the Program Up/Down buttons to instantly switch between your presets, and use the FX button to unload powerful effects. AmpDock's pedalboard even includes an expression pedal that can be used for volume control or to send MIDI control changes like wah, frequency, or delay. You'll also have instant access to Main, Headphone, Input 1, and Input 2 level controls with dedicated knobs on the AmpDock for easy adjustment of these crucial settings." Includes: 1/4" high-impedance guitar input and an XLR-1/4" combo input, 1/4" outputs with Guitar/Mic and Ground Lift switches, USB MIDI port, headphone output with volume control, and more. The pedalboard controller allows you to control volume, bypass, program changes, and other parameters. Tell me about stores I can add onto the list! I open to any suggestions! Because we use the Home button so often on iOS devises, its speed usually gets slower and thus irritating. Luckily, there's a way to fix it. Open one of your standard applications (e.g. weather, clock, stocks), and continue to press the sleep button until the power off slider appears. From there, you just continue to press the Home button until your standard application is shut down. And now your home button should be working fine! I haven’t worn a watch ever since I got my own cell phone with watch functions over 10 years ago. It feels like one extra thing to carry on your body when the cell phone (now, smartphone) does everything a watch will and ever has done. But, today, there seems to be an engendering revival of the timepiece in the form of a “smartwatch” with text message, phone call, SNS, and GPS functions. Instant access to datafeed on our wrists is much more mobile, flexible, and quicker than, say, getting our phones out of our pockets. In the forefront of this movement for smartwatches is the use of Apple’s iPod Nano as a wristwatch. The idea existed ever since Steve Jobs announced the 6th generation Nano and joked in September 2010 that one of the company’s board members planned to wear it as a watch. 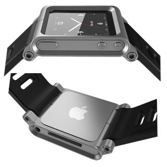 Currently, the two major watchbands for the Nano are made by iWatchz and Lunatik. iWatchz is cheaper and has a broader collection with far more options in style and color. It has the Q, Q2, Carbon, Nappa, Force, Icarius, Vintage, Timepiece, and Elemetal models, while Lunatik as of now only has the TikTok and LunaTik models in a few variations. Although it’s slightly heavier than the iWatchzQ, the peg adjustment system of the TikTok strap makes it a better fit to the wrist. And TikTok provides a much smoother transition from clip mode to watch mode. At YourMacStore.com, you can get your own TikTok and LunaTik watchbands for only $34.95 and $69.95 (LunaTik Black: $79.95). How my 2GB iPod Nano 1st gen turned into an 8GB 6th gen iPod nano! Since November 2011, Apple’s had an “iPod nano (1st generation) Replacement Program” http://www.apple.com/support/ipodnano_replacement/, more than 6 years after its debut. Apple determined that, in very rare cases, the battery in the iPod nano may overheat and pose a safety risk. Affected iPod nanos were sold between September 2005 and December 2006. As far as I remember, my iPod nano is a 1st gen. iPod nano 2GB, which I bought on the first day it was in stores. I haven’t been using this iPod for long, and a replacement didn’t make any sense, but I followed the replacement procedure anyways. It was a 6th gen. 8GB iPod nano Silver!! Well, actually, I already knew about this from rumors that had already been spread by others who returned their old iPods…so it didn’t surprise me at all. I think most people will be happy about this replacement, but I was confounded, because I have future ambitions of building a personal Apple museum. It would’ve been nice if Apple could’ve at least written about this exchange in their replacement program page. Anyways, to put this upgrade to good use, I decided to use the nano with a LunaTik watch kit. I’ll use it not to listen to music, but this time as a watch and photoframe. 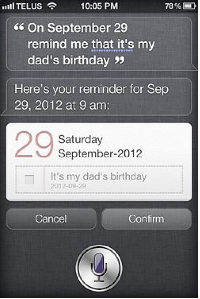 Siri, our much-loved personal assistant on our iPhone, is not a new-born creation. She has a history that dates back prior to April 28, 2010 (when it was acquired by Apple). Siri was founded in 2007 by Dag Kittlaus (CEO), Adam Cheyer (VP Engineering), and Tom Gruber (CTO/VP Design), together with Norman Winarsky from SRI International’s venture group. SRI International (the Stanford Research Institute) in Menlo Park, California, dates back to 1946 and was established by the trustees of Stanford University. This non-profit institute supports economic development in the region as a center of innovation. The mission of SRI is the discovery and application of science and technology for knowledge, commerce, prosperity, and peace. On October 13, 2008, Siri raised $8.5 million in investments from Menlo Ventures and Morgenthaler Ventures. In November 2009, it raised another $15.5 million from the same investors, but especially the Hong-Kong billionaire Li Ka-shing. Menlo Ventures, founded in 1976, has invested in other companies and projects such as 3PAR, Ironport Systems, Playspan, Coraid, and Vidyo. Morgenthaler invests in companies like Evernote, NexTag, imeem, and Cortina Systems. Li Ka-Shing is the world’s eleventh richest person at $26 billion net worth. He’s the richest East Asian person, and was named "Asia’s Most Powerful Man" by Asiaweek in 2001. In terms of R&D, Siri is backed by 40 years of research funded by DARPA to SRI International’s Artificial Intelligence Center that developed the CALO (Cognitive Agent that Learns and Organizes Programs). This is also the crystallization of research from institutions such as Carnegie Mellon, University of Massachusetts, University of Rochester, and USC. Siri, our closest friend (yes, physically too), didn’t just come from nowhere. It came from our nation’s most prestigious university, Stanford’s premier research institute, that has been funded by the government’s think tank DARPA. It was also funded by the best investment companies in the US and by East Asia’s wealthiest and most powerful person. Of course, Apple’s the one who bought Siri and commercialized her, but sometimes knowing her history gives us that much more appreciation towards our iPhones.